Place pork in slow cooker, add vinegar, water, salt & pepper, hot sauce. Turn slow cooker on high for about 3 hours then turn down to between low & medium and cooks until you can pull pork easily with a fork. Add more hot sauce and I just add a little barbecue sauce. 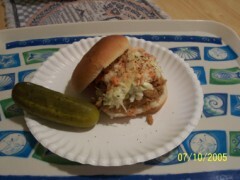 Spoon on buns with cole slaw & more hot sauce.